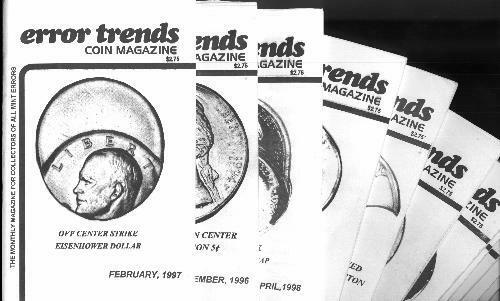 Paul Gilkes reported in the January 16, 2012 issue of Coin World that Error Trends Coins Magazine has ceased publication. Production was suspended nearly a year ago when published Arnold Margolis, now 86, had a stroke. Although Arnie is at home recovering, the cessation has become permanent. I helped Arnie create a web site for his magazine several years ago and would periodically help him with questions and problems. ETCM was a pioneering publication in the error field. Arnie is also the author or coauthor of several books on the topic. We wish him luck on his continuing recovery.